Algae is more or less inevitable in home aquariums, but it generally poses less of a threat to freshwater ecosystems than to saltwater tanks. Still, unchecked growth can become excessive and detract from your aquarium aesthetics. More importantly, though, algae overgrowth indicates probable ecosystem imbalances that should be corrected for the health of your fish, other underwater creatures and plant life. Various kinds of algae inhabit freshwater aquariums. Diatoms are brown with silica-based cell walls, usually taking hold in tanks with low lighting. Red algae, counterintuitively, are a dark or dirty green, with different subspecies known as hair, brush and beard algae. These typically begin growing on plant leaves, but may appear on other tank items. Green algae -- one type of which are the ones that turns pond water, and sometimes tank water, green -- are fairly common and thrive in bright lighting, but are a favorite snack of many freshwater fish, so they don't often achieve overgrowth. Blue-green algae most easily achieves overgrowth in nutrient-rich, still water; infrequent water changes and too little circulation are the biggest contributors. Manually removing algae with appropriate items like algae scrapers or magnets is an effective way to clear out the overgrowth. However, it's a temporary solution; if you don't correct the conditions promoting their growth, algae blooms simply return. Still, it's a good way to gain the upper hand at the outset, so go ahead and clean the stuff out. You might consider adding freshwater algae-eating fish or invertebrates as soldiers in your war on algae, but keep in mind that most only eat green algae, so they won't help if you have a different type. Often, changing the lighting situation in your freshwater aquarium helps battle algae overgrowth. More often than not, you're providing too much light. Your tank shouldn't ever receive direct sunlight, so if necessary, move it or shade it. Also, six to eight hours is the maximum amount of time your tank light should be on in a day. If your light bulbs are more than one year old, replace them; their wavelengths alter over time, and it's a safe bet they're currently at a level favored by your algae. Of course, if you have plants or fish that require specific lighting, don't ignore that. However, that's more often a concern with saltwater tanks and coral. Algae needs ammonia, nitrates, phosphate or other compounds in the water to fuel its growth. Invest in a testing kit if you don't have one to figure out which levels are elevated and research the specifics of correcting your findings. However, because there's so much algae in your tank, it may be consuming nutrients fast enough that levels don't seem particularly high when you test. Confirm your filter and other equipment is working properly, then clean it anyway. Check that there are no dead and decaying fish in your tank. Feed your fish only once per day, and only as much as they eat before they start spitting it out, since leftovers breaking down provide nutrients that help algae grow. Clean debris out of your tank with a net daily. 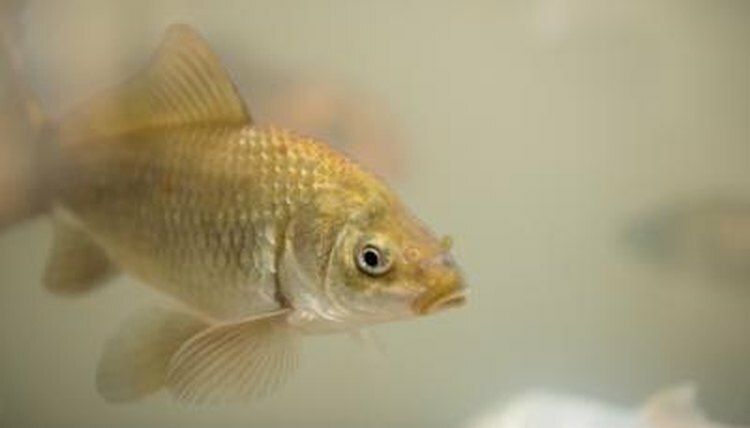 Also, make sure your tank isn't too crowded; an overabundance of fish will create more waste than filters can handle. Algae loves carbon dioxide, so aeration is important to keep growth at bay. The added circulation also makes your freshwater tank less hospitable to algae, especially blue-green algae. Add an air stone or bubble wand to your tank, or a little fountain or other device that disturbs the surface of the water to increase oxygenation and water motion without creating strong currents your fish might not appreciate. Also, don't forget to perform bi-weekly partial water changes. Replace about 10 percent of your tank's water at a time to help keep it clean and maintain ideal nutrient levels.